Overall Print Size: 28" x 20"
All are signed by Lancaster pilot Flt. Lt. Phil Ainley DFC and the RAF top (21 victories) night-fighter pilot Sqn. Ldr. Branse Burbridge DSO and Bar, DFC and Bar. The dawn of a new day illuminates a Lancaster of 57 Squadron returning to East Kirkby from night ops over occupied Europe, escorted by a Swannington based Mosquito night fighter of 85 Squadron. Flt Lt Phil Ainley DFC (57 Sqn. Pilot) was accepted for aircrew training in February 1942 at the age of 17½ years. He was selected for pilot training and was sent to the United States Naval Aviation base in Pensecola. After gaining his United States Navy wings on completion of his Catalina flying boat course, he was commissioned and returned to the UK. Following retraining on land planes, he eventually joined No. 57 Lancaster squadron in May 1944. 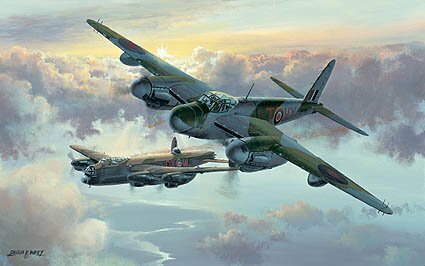 The squadron was heavily engaged in attacking both French flying bomb sites, the build up to D. Day and German industrial targets. One sortie to Konigsberg necessitated flying for 11 hours 10 minutes, whilst another was to drop mines in the Stettin canal from 250 feet. For this last sortie Flt Lt Ainley was awarded an immediate DFC. He completed his operational tour of 33 sorties in October 1944, having flown all this time with the same crew with the exception of a replacement flight engineer. On completing a course at the Bomber Command Instructors School, he became a flying instructor in Bomber Command. Wing Commander Branse Burbridge DSO and Bar, DFC and Bar (85 Sqn. Pilot) gained his wings in 1941. Putting duty before personal feelings as a conscientious objector Branse, together with his navigator, Bill Skelton, became known as “the night hawk partners”. The citations for their awards paid tribute to both men setting “an unsurpassed example of outstanding keenness and devotion to duty”.